We’re proud to present our second annual list of the 100 most influential figures in the cannabis space. Brothers Ramsey and Adam Hamide moved from online ticket brokering to finding success in the cannabis retail space. Their three Main Street Marijuana stores were the highest-grossing retail stores in Washington State from 2015 through 2018, with over $100 million in sales as of 2014. They credit their success to stellar customer service, competitive prices and top-quality products. Brooke Gehring is recognized as one of the country’s most successful female entrepreneurs in the medical and adult-use cannabis industry with over a decade of expertise in regulated cannabis. She founded Live Green Consulting in Denver in 2009. She is Co-Founder, Chairwoman and CEO of FGS Inc., the parent company of Patients Choice of Colorado and Live Green Cannabis, a vertically integrated medical and adult use cannabis company. Outside of Colorado, she has pivoted her extensive retail, government relations, and vertically integrated operating experience to be a prominent consultant to multi-national licensees across the US, Canada, and Europe. Gehring continues to focus on her commitments to her industry advocacy Board affiliations along with a vigorous 2019 – 2020 roll out of over 40 storefronts and facilities in established and emerging US markets from coast to coast. Jelly Wang and Joe S. were both part of CCELL’s founding team. Jelly Wang has over 17 years of experience in R&D management and is a board member of Shenzhen Smoore Technology Limited, CCELL’s parent company. Joe Qi is CCELL’s marketing director. CCELL is one of the leading brands in the vaporizer technology space, known for their innovative and disruptive vaping technology. CCELL’s revolutionary ceramic heating elements are capable of providing high vaporizing efficiency, even heat distribution, steady and consistent vapor, large vapor production, pure flavor and powerful potency. Joe S. is the Marketing Director of CCELL, and has nearly 10 years of extensive experience in the consumer electronic product industry. He is responsible for the CCELL brand definition and promotion, making it a brand from zero to being well-known in the industry. He is also in charge of defining CCELL’s new products and developing business models. With his and his team’s efforts, the CCELL brand reputation and its market share have both reached new heights. A loving husband and father first, Garyn Angel is the mind behind MagicalButter. The MB2e is an innovative kitchen gadget that infuses herbal essences into foods. Angel is not only a found of this company, but many others, and he’s won awards for his work in finance, investing, and philanthropy. CNBC placed him on its “NEXT List” of business visionaries for his work in the cannabis industry, alongside noted CEOs of Apple, GM, Google, Tesla, Netflix, and Twitter. Michael Gorenstein is the chairman, president and CEO of the Cronos Group, an innovative cannabinoid company with international production, spanning across five continents. It operates within Health Canada’s Access to Cannabis for Medical Purposes Regulations and is internationally recognized. Gorenstein is also a member of Gotham Green, a leader in the cannabis investment community. Prior to that, he was a partner at Alphabet Ventures LLC. After working in the entertainment industry in Los Angeles for several years, Sher Joudeh, a Colorado native, moved back in 2014 to work as VP of Finance for Starbuds. She has become a leader in the company and cannabis industry. In five short years, Sher has helped grow Starbuds from a local business to a chain of international dispensaries. Sher has made significant contributions transforming both operations and finance not only for Starbuds but the industry as a whole. As one of the first pioneers in the recreational marijuana business, Sher has been an avid activist and advocate for women’s involvement and progression in the industry. 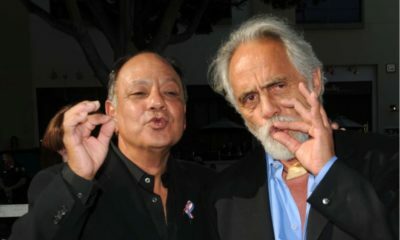 Sher’s success and industry involvement has led her to be featured throughout the media, including MSNBC’s Pot Barons. Kyle Tracey is co-founder and VP of Business Development at the award winning, California based company F/ELD Extracts. Throughout his extensive career in the cannabis space, Mr. Tracey has developed and brought to market multiple award winning products and brands such as Stealth Grow LED, HIVE Ceramics, Madrone Farms, Restalk and Cebadora. He is regarded as a pioneer within the cannabis industry for his work developing new technologies and bringing brands to the forefront of the space. A master cannabis cultivator, Mario Sherbinski oversees a high-end lifestyle, eponymous weed brand that saw business explode after its impressive Gelato strain won countless fans across the country. Its cousins Bacio, Acaiberry, Mochi and Gello further cemented a demand for the Sherbinskis product line. Celebrity musicians including John Mayer and Migos love Sherbinski’s products, Entrepreneur magazine awarded his company “Top in Flower” in 2018, and his business’s brand growth includes a new accessories and apparel line and a Los Angeles-based dispensary in progress. Tony Verzura has over 20 years of experience in the cannabis industry helping patients find solutions through a wide range of innovative solvent-less products. His work in the field of cannabis derived terpenes and solvent-less extraction techniques has been earned him nearly 80 cannabis awards world-wide and one of very first US granted cannabis patent holders. Mr. Verzura has had special guest appearances on CNBC Money Talk, Viceland’s Bong Appetite, and Hotboxing with Mike Tyson. His publications include The Washington Post, High Times, VICE, Culture Magazine, DOPE Magazine, Kunk Magazine, Sensi Seeds, and Frank151. Greg Engel is CEO at Organigram Inc, a leading publicly-traded licensed producer of cannabis in Canada. With more than 30 years of experience in the pharmaceutical, biotechnology, and consumer packaged goods industries, including a CEO role at a competitive licensed producer to become the first Canadian exporter of medical cannabis, Mr. Engel is a thought leader in the cannabis space wholly committed to product and service excellence. In his role at Organigram, Engel is proud to lead the company’s medical and recreational cannabis programs and the introduction of precedent-setting recreational brands, including the Edison Cannabis Co. and Edison Reserve premium product lines. Holy Cross alum Kevin P. Murphy is the CEO of Acreage Holdings Inc. (formerly High Street Capital Partners), whose website boasts they’ve “been doing this a long time,” this being managing the largest collection of rights to grow, process and sell cannabis across 19 states and counting. Murphy works with legislators, doctors and researchers to raise the bar for standards in the cannabis industry. His history of raising capital, his impressive business acumen and his ace team of retail, food and beverage, and finance veterans show he’s thinking sky-high. Constitutional lawyer and serial entrepreneur Paul Rosen was the CEO of PharmaCan Capital. Rosen also founded BreakWater Venture Capital, which boasts a portfolio of over 150 investments. Rosen is currently director of the Hill Street Beverage Company and sits on the boards of many cannabis businesses, including iAnthus Capital Holdings. His leadership has been paramount in developing several start-up ventures. With a background creating B2B firms, Ryan Smith was the first cannabusiness CEO featured on the Forbes “30 Under 30” list, and his business, LeafLink, the first cannabusiness ever placed on the Fast Company “Top 10 Most Innovative Companies” list. Known for excellent customer service, LeafLink is an industry-standard platform for ordering, management and product sales. It’s raised over $14 million in capital, and over 2,900 retail shops use it to order from more than 900 products across America. John Fowler is the President, Founder and a Director of The Supreme Cannabis Company, Inc. He spent more than a decade in the medical cannabis sector as a cultivator, influencer, patients-rights advocate and lawyer. In 2013, Mr. Fowler founded Supreme Cannabis’ wholly-owned subsidiary 7ACRES with a clear vision: to create Canada’s leading premium cannabis flower brand on a commercial scale. Mr. Fowler is also Vice Chair, Adult Use, and a Director of the Cannabis Council of Canada, the leading organization of Canada’s licensed producers of cannabis under Health Canada’s federal Cannabis Act.